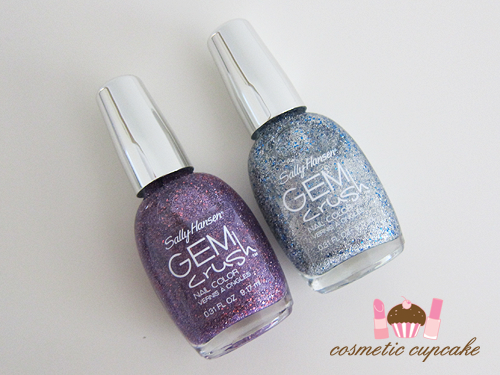 I am a glitter polish fiend so I was extremely excited to be given the opportunity to try some of the polishes in the new Sally Hansen Gem Crush nail color collection recently! A collection of 8 pretty glitter polishes? OH YES! I have swatches for you today of Be-Jeweled and Showgirl Chic. 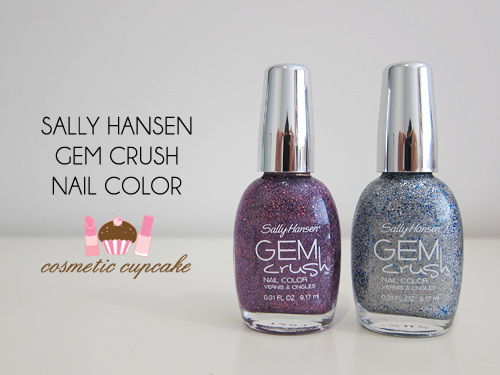 "Always at the forefront of nail innovation, Sally Hansen presents the latest in statement-making manicures - the new Gem Crush Nail Color; high impact bling and full coverage glitter polish. Unlike other glitter formulas, Gem Crush Nail Color delivers high-intensity sparkle for a brilliant, multi-dimensional manicure that simply glimmers. Available in eight daring shades, each color brings a major dose of glitz and glamour to your nails." Be-Jeweled is contains small light purple glitter with larger round pink glitter in a clear base. 3 coats is pictured. 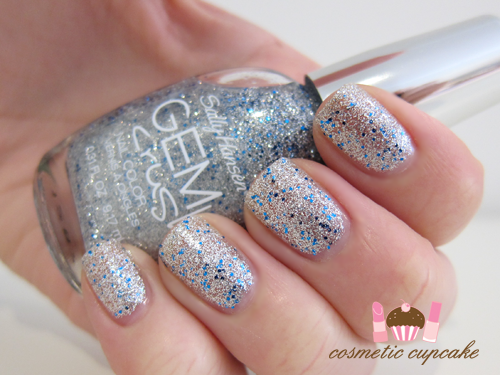 Showgirl Chic contains small bright silver glitter with larger medium blue glitter pieces in a clear base. This is super sparkly and looks fantastic! 3 coats if pictured. Overall: Being glitters they are SUPER annoying to remove but well worth the effort! They are super fun and sparkly and there's a great selection of shades in the range - there are bright reds to blues and purple. The formula could be a tiny bit thicker so you don't need as many coats but they dry quickly so it's not too much of an issue. They applied smoothly overall - no clumping or anything and were opaque in 3 coats. The finish is very gritty so I'd suggest a thick topcoat for a smooth finish. 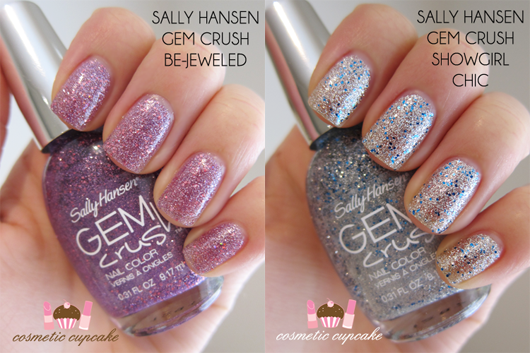 Details: The Sally Hansen Gem Crush nail color collection is available now in 8 shades from Target, Kmart, Priceline, Priceline Pharmacy and selected pharmacies nationally for $9.95. Selected shades are available from Coles and Woolworths. Will you try these out? Thanks for looking! Bejeweled looks so pretty! I have Lady Luck which isn't normally a colour I go for, but I really like the holo glitter in it. It was a huge pain to remove though. I've tried these out and I love them! I have them in Big Money (which is a gold colour) and Razzle Dazzle (which is pink!) and they're both beautiful! I found chipping a little bit of a problem the first time I wore them, so probably worth wearing a quality base and top coat to seal them in! Those are gorgeous colours though, I may have to pick up that purple one!!! I've been eyeing these polishes for a while now. I really want them! But I know how annoying glitter is to take off... I usually end up scraping it off my nails because I'm so impatient lol! Ps. If you haven't already, please visit my blog :)I'm holding my first giveaway! Oh, pretty! I haven't liked these very much in swatches, but your pictures make them look wonderful, all twinkly and magical. Very pretty ! I have been meaning to pick these up for a while now ! They look beautiful on you! I've never seen anything like Be-Jeweled! I love these colours :D they look so awesome! Do they chip easily? Oh wow! Such gorgeous colours! very pretty! the silver one looks like china glaze - lorelei's tiara :D do they wear well?